MILWAUKEE (AP) Jabari Parker waited nearly a year to get back on the court with the Milwaukee Bucks. He made an immediate impact with 12 points, including seven in the first quarter, and Giannis Antetokounmpo took it from there. 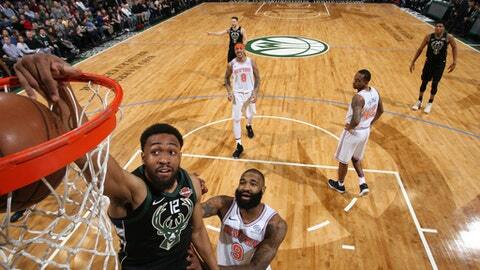 Antetokounmpo made a driving layup with 1.9 seconds remaining to lift the Bucks over the New York Knicks 92-90 on Friday night in Parker’s return. The Bucks got their fifth win in six games. Antetokounmpo, who sprained his left ankle late in Thursday night’s loss to Minnesota, showed no ill effects and led all scorers with 29 points. He hit the winner by spinning around a defender in the lane and going up with his left hand over Enes Kanter and Kristaps Porzingis. He jogged back down the court with his tongue hanging from his mouth while the home crowd roared. ”I was able to find the lane,” Antetokounmpo said. Parker hadn’t played since tearing his left ACL on Feb. 8, 2017, in a game against Miami. He made 4 of 7 shots over nearly 15 minutes as a reserve. Kanter had 17 points and 18 rebounds to lead the Knicks, who were coming off a 103-73 loss to Boston on Wednesday night. Porzingis also had 17 points. Entering the fourth quarter tied at 74, the Bucks and Knicks continued their seesaw battle with neither team able to pull away. A layup by Antetokounmpo tied it at 90 with about two minutes remaining. After Tim Hardaway Jr. missed a pair of free throws for New York, Antetokounmpo failed to connect on a step-back jumper with 41.8 seconds left. After Kanter missed a layup, Antetokounmpo hit his decisive layup. Knicks coach Jeff Hornacek said he thought his team made a strong effort against Antetokounmpo on the play. After a Knicks timeout, Hardaway Jr. – who made just 1 of 14 shots – missed a deep, off-balance jumper at the horn. The teams were tied at 55 at the half. Milwaukee got 13 points from Antetokounmpo and 12 from Parker, who played nearly 10 minutes in the first half. Kanter had 11 points and 10 rebounds. Milwaukee got a much-needed spark from Parker in the first quarter. He scored seven points in just more than five minutes of action to help pull the Bucks within one point at the end of the quarter. Parker’s return comes at a critical juncture of the season, with the trade deadline looming next week and Milwaukee in the middle of the Eastern Conference playoff race. He entered the game with 5:25 remaining in the first quarter, replacing Antetokounmpo. He scored his first basket on a jumper from the right baseline a little more than one minute later. The second overall pick of the 2014 draft out of Duke averaged career highs of 20.1 points and 6.2 rebounds in 51 games last year before the injury. Parker tore the same ACL in December 2014, halting his rookie campaign after 25 games. Kanter, who suffered a lacerated lip in practice Monday that required several stitches, said doctors told him the wound could re-open with any contact to his mouth. ”Right now, I don’t really care about the stitches. My thing is to just sacrifice everything I have,” he said. Knicks: Referees halted the game briefly in the first quarter so that Porzingis could be treated for a cut to his lip. … New York made 2 of 13 from deep in the first half. Porzingis and Hardaway Jr. were a combined 1 for 8. Hardaway Jr. finished the game 0 for 9 from long range. Bucks: G Malcolm Brogdon is expected to miss six to eight weeks after being diagnosed with a partially torn left quadriceps tendon. … G Eric Bledsoe, who missed Thursday’s game and played just three minutes Monday due to left ankle soreness, returned to action. Knicks: Host Atlanta on Sunday in the last of three regular-season meetings. Bucks: At Brooklyn on Sunday. Milwaukee defeated the Nets 116-91 on Jan. 26.